Innovation is the buzzword for the breadth of EFI's solutions at drupa 2012. On stand C01 in Hall 5, the company’s industrial inkjet solutions will include introductions to its wide-format platforms, the award-winning Fiery® portfolio, and complemented by the latest productivity software including new cloud-based MIS and web-to-print offerings. At drupa, EFI will demonstrate how its latest integrated technology can enable customers to transform their businesses and benefit from areas of solid growth in print across all commercial sectors. 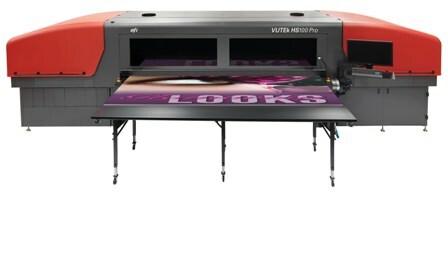 Visitors to the EFI stand will see the debut of the 3.2m VUTEk® HS100 Pro, which the company says is set to become a true screenprint replacement with image quality approaching offset. Driven by EFI's advanced Orion software and the Fiery proServer, the HS100 Pro is billed as having “blazing fast throughput rates, low ink consumption and innovative pin curing to guarantee precise droplet placement”. The VUTEk QS2 Pro is also being launched at the show, targeting the mid-range 2m sector with six-colours plus three layers of white. EFI maintains this printer has a low print cost that doesn't compromise colour quality. Both machines benefit from variable drop greyscale printheads and EFI's advanced ink formulation. EFI Orion OS is a robust, integrated operating system specifically engineered to maximise the capabilities of every new EFI Wide Format and VUTEk inkjet printing system. Orion OS contains a special set of expandable features that optimise printer technology and functionality. It controls a powerful combination of software and hardware that work together to provide greyscale readiness, remote assistance, enhanced colour, integration and improved performance. Another printer on show is the EFI's Jetrion® 4900 which the company says has brought print-and-cut capabilities to label converters in a fully integrated narrow-web digital press that caters to shorter runs and greater levels of flexibility. This digital label production machine features CMYK and a highly opaque white ink, plus powerful laser cutting, resulting in a complete production line that’s ideal for the manufacturing of high-quality durable labels on a wide variety of substrates. Fiery digital front-ends continue to provide cutting-edge RIP performance and support for leading VDP (variable data printing) industry standards. EFI said visitors to its stand would also see the fastest-yet Fiery server with HyperRIP technology which it claims reduces processing times by up to 40 per cent, running the latest VDP standard, PPML 3.0. The company will have Fiery technology demonstrations include new workflow automation, advanced job make-ready software, and new voice activated commands that remotely control the Fiery as well as the digital engine attached to it. The stand will also showcase Fiery's support for the new Altona Test Suite 2.0 and advanced colour profiling and spot colour solutions for demanding colour professionals. EFI believes its productivity software portfolio caters to every type of print business, with MIS and web-to-print products designed to simplify operations for a more streamlined workflow and intelligent automation. The latest versions of the browser-based EFI Pace™, EFI Monarch, EFI Radius, and EFI PrintSmith™ Vision will be on display at drupa as well as the latest version of the EFI Digital StoreFront® web-to-print platform with integration to Fiery technology. During the show, EFI will announce cloud-based remote data protection offerings for Print MIS and web-to-print customers.